Morris, of the 49ers' Gold Rush squad, has taken a knee during the National Anthem at two games this month. 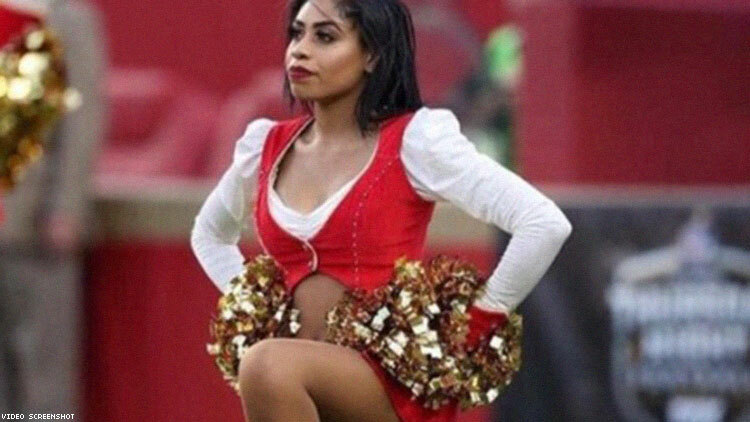 Every NFL team has their own code of conduct rule books, but Business Insider reported that cheerleaders for the 49ers "cannot tell people that they are affiliated with the team." What ramifications could Morris be facing? The answer is uncertain since Morris, and the other women of the Gold Rush, aren't employees of the 49ers or the NFL. Rather they twork for e2k, an "events and entertainment" company that "view(s) events as a vehicle to bring inspiring visions to life." Who has final say on cheerleaders' actions and consequences is up in the air or at the very least hard to determine at this juncture. 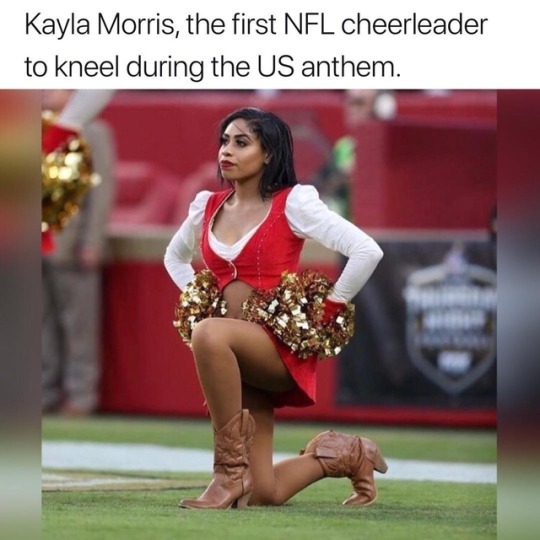 By taking a knee, Morris did more than just proclaim her solidarity with the athletes who have protested before her, she made an statement for all of the women in her line of work. Overly restrictive, underpaid working conditions are a constant reminder to the cheerleaders of just how replaceable they are. As KQUED said, "These talented women are supposed to be so grateful for the opportunity that they'll fall in line with whatever their teams ask of them, no matter what. Kayla Morris is an essential reminder about the individuality and agency of these women." Morris told the 49ers' website last year that she had, "learned that it takes more than dance skills to be on this team. You learn how to represent yourself in a professional manner and become more confident in everyday life because you are surrounded by amazing women who are constantly encouraging each other."